Most newer roof materials are built to withstand pressures ranging from 15 to 30 pounds per square foot, but you can't rely on your roof to do all of the heavy lifting without properly taking care of it first. Regular roof maintenance could mean the difference between having a roof over your head or replacing expensive asphalt shingle roofs. Instead of saving up for new metal roofing, you could blow through your home improvement budget on emergency roof repairs. If you want to extend the life of your roof, here are a few best practices that you should be following. This might seem like a pretty obvious one, but that doesn't make it any less important. That's because cleaning your gutters helps the rest of your house, as well. When water is properly diverted to storm drains through clean gutters, it reduces the likelihood of basement flooding, stained siding, and ice dams that will damage your roof. Keeping your trees trimmed properly is another simple way to extend the life of your roof. If large branches are too close to your roof, even a small storm could cause disastrous damage to your roof. Keeping tree branches away from your roof is going to save you some serious damage in the future. Roof maintenance is dangerous, especially if you're not familiar with being on a roof. Roof repairs and general roof maintenance should always be performed by a residential roofing contractor, not you. Not only are you risking serious injury, you're risking serious damage to your home if you do the repairs incorrectly. If you've done all you can and your roof has finally reached the end of its hopefully long life, then it's time to get a new roof. And today, most roofing experts will recommend metal roofing. Metal shingle installation is designed to last much longer than traditional asphalt shingle roofs. Not only is it more durable than asphalt shingle roofs, it's more sustainable as well. 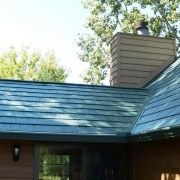 Metal shingles contain large amounts of recycled material. 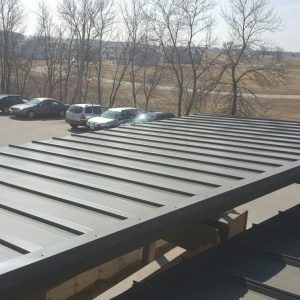 If you're looking for the best metal roofing Madison Wisconsin has to offer, look no further than Paramount Roofing and Siding. Learn more about how Metal Roofing can add value to your home. Taking care of your roof is essential if you want to keep it for a long time to come. If you're not sure where to begin, call Paramount Roofing and Siding today to discover what kind of roofing repairs you need to ensure a strong roof for a lifetime.